Betties N Brimstone: Why don't they make this stuff for adults?! I was over at my nieces' house for a birthday party, and noticed these cool toothbrushes in their bathroom. 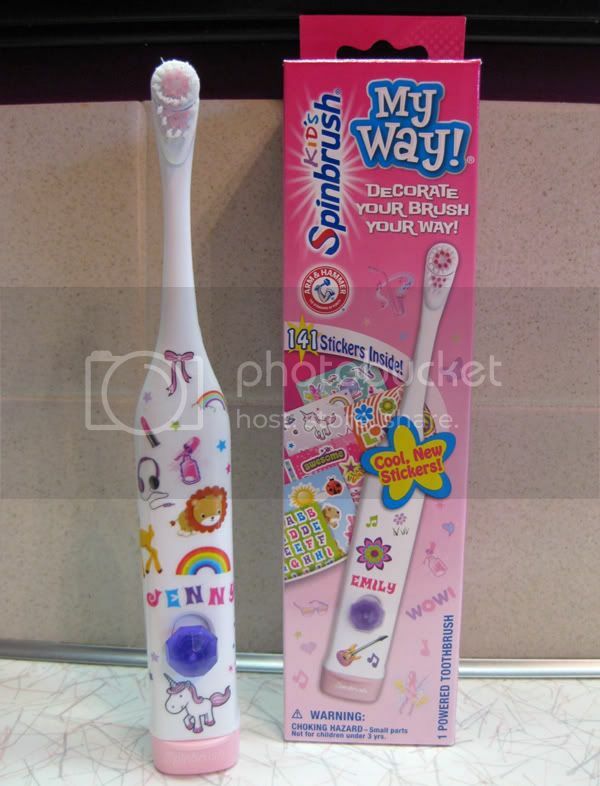 Of course, I immediately asked about where they got them, and did the stickers come with the toothbrush (or had they added them later on themselves)? I found out this is sold at Target! 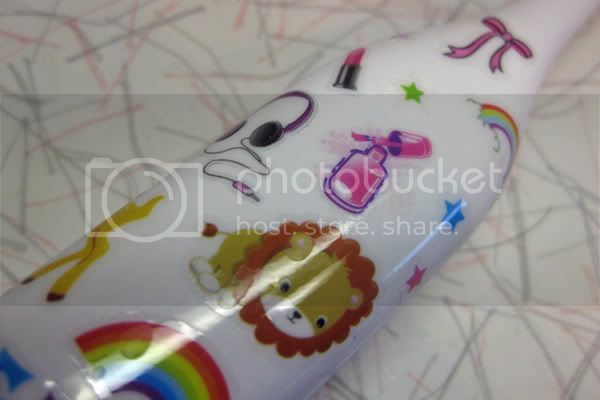 I also found out that the stickers come WITH the toothbrush. And, when I went to purchase one for myself, I found out it was on sale for less than $5! Whoa. This puzzles me. Why wouldn't an adult want an electric toothbrush that is a) inexpensive, b) has a nifty jeweled on/off switch, and c) customizable with stickers?! Um, HELL-O manufacturers... get on that, ok? In the meantime, I will purchase myself a "Spinbrush for Kids" regardless of you labeling it for someone not in my age bracket. By the way, did I mention that these stickers are special clear waterproof ones meant for staying power on the ol' toothbrush? Nice. 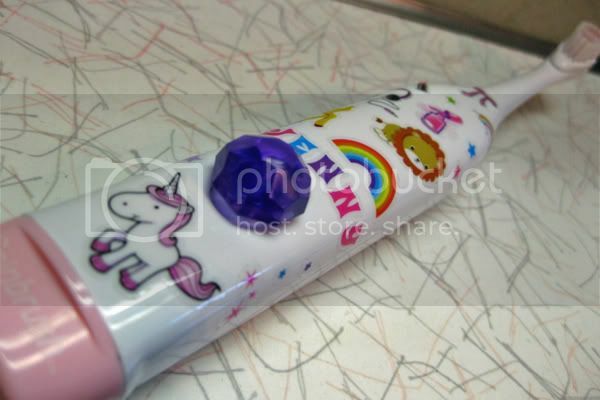 I briefly considered buying this brush primarily for the special stickers and putting them on an "adult" electric toothbrush, until I realized I wouldn't have a sweet jeweled on/off switch. Boo. I'm sure that this post will very likely become a whole series of "Why don't they make this for adults?" related-posts very soon. p.s. School has started, and not only am I super stressed about my full-time teaching job, I'm wearing a new "hat" as a union person in my district this year, and also handling my first pregnancy. So apologies if my infrequent posting slows to a virtual crawl. I'm not going anywhere... just moving a lot slower. Thank you for your patience.